BP Oil Spill: One Year Later, A Look Back In Pictures On April 20, 2010, the Deepwater Horizon oil rig exploded, killing 11 workers and setting off the worst offshore oil spill in U.S. history. Fishermen and other businesses struggled; the claims process has been excruciatingly slow. Here, a visual tour of the past year. On April 20, 2010, the Deepwater Horizon oil drilling rig exploded in the Gulf of Mexico, setting off the nation's worst oil spill. 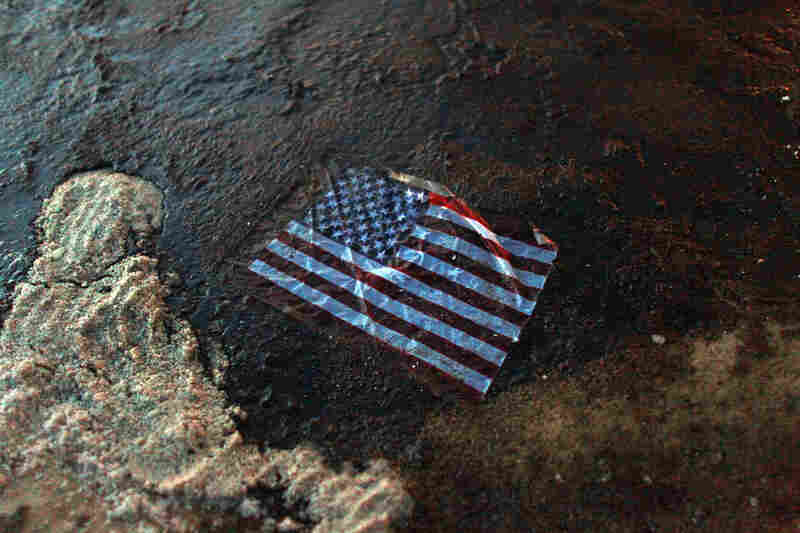 An American flag lies in a slick of oil that washed ashore in Gulf Shores, Ala., July 4. Left: The Deepwater Horizon oil rig burns on April 21, 2010. Most workers were evacuated, but 11 died. The rig sank the next day. Right: Pat Bordelon (right) consoles Micalet Kemp, whose brother, Roy Wyatt Kemp, 27, was among those killed. Left: Smoke rises above the Deepwater Horizon oil rig, April 21, 2010. Right: A worker watches as gas from the damaged wellhead is burned by the drill ship Discoverer Enterprise in a process known as flaring. Left: Smoke rises from a controlled burn above the oil-slicked Gulf of Mexico. Right: A May 24, 2010, NASA satellite image shows the slick spreading near the Mississippi Delta. Left: A fisherman talks on his cellphone as he and others wait to hear about BP's plan to have fishermen help clean up the oil spill, April 29, 2010, in Venice, La. Right: President Obama makes his first public comments on the spill on April 29, nine days after the accident began. Left: Birds fly over oily water near the Chandeleur Islands in the Gulf of Mexico, south of Louisiana, April 29, 2010. Right: A U.S. Coast Guard Basler BT-67 releases oil dispersant, May 5, 2010. Left: Fishermen in Venice, La., listen about possible work with BP cleaning up the growing oil spill, April 30, 2010. Days later, the U.S. government banned fishing in areas affected by the spill. Right: Coast Guardsmen on Marine Vessel Braxton Perry recover a deflection boom during controlled burns in the Gulf of Mexico, May 7, 2010. Left: Phil Radford, executive director of Greenpeace USA, inspects oil-covered reeds south of Venice, La., May 20, 2010. Right: Tony Hayward, then CEO of BP, answers questions from the media on an oil-stained beach in Port Fourchon, La., May 24, 2010. Left: Commercial fisherwoman Diane Wilson of Seadrift, Texas, fights back tears as she is handcuffed after interrupting a Senate Energy and Natural Resources Committee hearing by pouring a jar of syrup made to look like oil over herself, June 9, 2010, in Washington, D.C. Right: Consumer advocate Barbara Holzer pours chocolate syrup over a model duck while demonstrating in front of BP's Washington offices, June 4, 2010. Left: A worker collects oil for research purposes in Bay Jimmy, off Grand Isle, La., June 15, 2010. Right: A pelican drenched in oil is cleaned at the Fort Jackson Oiled Wildlife Rehabilitation Center in Buras, La., June 11, 2010. Left: Vacationers enjoy the shoreline in Biloxi, Miss., July 4, 2010. Right: Egrets with oil-stained feathers stand on a barrier island in Cat Bay, near Grand Isle, La., June 28, 2010. Left: Louisiana crab trap builder Shawn Platt stands before his traps, which were idled by a May 2010 federal government ban on all fishing in areas stretching from Louisiana to Florida. The fishing ban remains in effect in the immediate area where the Deepwater Horizon rig was located. Right: Then-BP CEO Tony Hayward testifies before Congress, June 17, 2010. Hayward resigned in July 2010. Left: A New Orleans Times-Picayune front page reads "Oil Flow Halted," July 16, 2010, in New Orleans. Right: Plaquemines Parish President Billy Nungesser walks through dead and oiled marshland in Port Sulphur, La., Jan. 7, 2011. Left: Ken Feinberg, the administrator of BP's $20 billion fund to compensate spill victims, shields his eyes from the sun as he listens to a question during a public meeting in Violet, La., June 25, 2010. Right: Claimants listen to Feinberg during a January 2011 town hall meeting in Grand Isle, La. As of April 15, 2011, only $4 billion has been paid out in claims. Left: Grand Isle residents returned to sport fishing in the months following the spill. Right: A worker cleans tarballs on Waveland beach in Waveland, Miss., Dec 6, 2010. Left: A dead sea turtle washed onto shore in Waveland, Miss., April 14, 2011. Right: Tourists lounge on the beach in Pass Christian, Miss., April 16, 2011. BP says it has made tourism payments of $18 million to Mississippi in an attempt to help draw tourists back to its beaches.